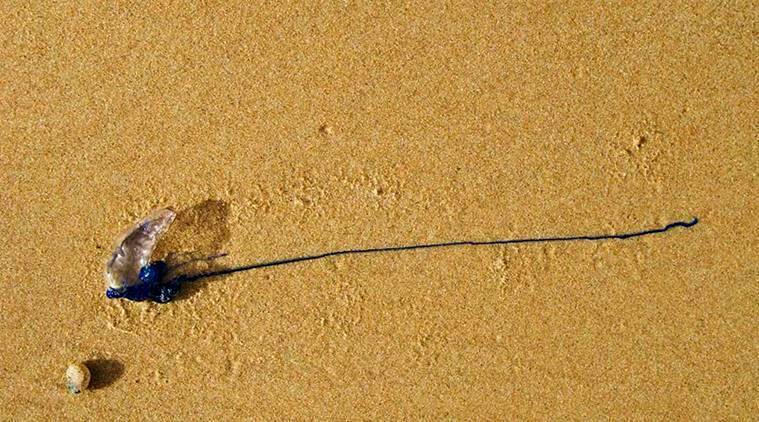 Blue bottle jellyfish, which is also known as the Portuguese man-of-war, created panic at Girgaum Chowpatty, Aksa and Juhu beaches in Mumbai over the past few days. The venomous fish has long tentacles, which injects the body and leaves an excruciatingly painful sting when it comes in contact with humans. The “floating terror” was also spotted at the popular Baga beach in North Goa. According to reports of The Hindu, the Drishti Marine, Goa Tourism’s beach safety agency, had issued an advisory for tourists and local residents to refrain from venturing into the sea at Baga beach as lifeguards spotted a cluster of the Portuguese man-of-war, a jelly-like marine organism, washed ashore. Usually found at the shore during monsoons when they come out for reproduction, the blue bottles are siphonophores, a group of colonial jellyfish. What makes the species unique is that siphonophores are actually made up of several colony members called “persons”. These members typically include feeding persons, reproductive persons, and stinging persons, among others. The blue bottle has a gas-filled bladder while other siphonophores have swimming bells similar to jellyfish. Meanwhile, a few others have both. The sting not only leaves a severe pain but a red rash on the skin for two to three days. The venom can also travel through the body to the lymph nodes and cause acute pain. Generally, the sting doesn’t need any medical treatment but if the pain stays for a long time, it is advisable to seek help. People who are allergic to seafood are also recommended to get proper medical treatment as if the sting is not treated, it can cause death. The general first aid recommended for such stings includes washing the skin with salt water followed by hot water with a pinch of Epsom salt for 15-20 minutes to kill the last part of the venom in the wound.